Since the beginning of her writing career, Lorna has been known for her inspired teaching and mentoring of other poets. Now a professor emeritus at the University of Victoria, she conducts poetry workshops across the country, particularly at Wintergreen and Naramata, and has taught at the Banff Centre. Beyond making poems, Lorna has also edited two non-fiction collections – Desire in Seven Voices and Addiction: Notes from the Belly of the Beast. Together with her husband and fellow poet Patrick Lane, she edited the 1994 landmark collection Breathing Fire: Canada’s New Poets; in 2004, they co-edited Breathing Fire 2, once again introducing over thirty new writers to the Canadian literary world. She also compiled and edited Best Canadian Poets, 2010. Her poems continue to be widely anthologized, appearing in 15 Canadian Poets and 20th Century Poetry and Poetics. Her work has been translated into several languages. A Spanish edition of her poetry, La Perspectiva del Gato was published in Mexico City. She has read around the world in every continent except Antaractica and she is the official travelling poet of the award-winning magazine Toque and Canoe. An Officer of the Order of Canada, her numerous awards include five honourary doctorates and a Governor-General’s Award for Poetry. In 2005 she gave a command performance for Queen Elizabeth II. 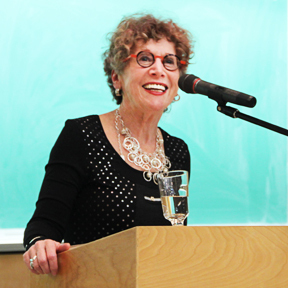 On November 28, 2013, the University of Victoria launched the Lorna Crozier Undergraduate Poetry Scholarship. Hosted by Shelagh Rogers, the event was a celebration of Lorna as a teacher, with anecdotes and readings. A full account is archived on UVic’s Faculty of Fine Arts website. If you wish to contribute to the scholarship, and to the next generation of Canadian poets, you can do it here. Lorna’s husband, poet Patrick Lane.